Posted on April 24, 2014 by Worth Stopping By . . . If you begin with a great ingredients, there is very good chance that you will end up with something great for your table. Filet mignon was on sale this week, and these two were so beautiful that I had to snap them up. Instead of grilling, I decided to start them on the stove-top and finish them in a hot oven. 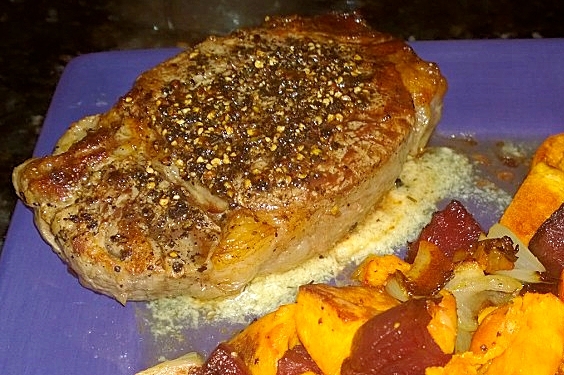 Cooksillustrated.com provides a wonderful tutorial on how to prepare a pepper-crusted steak. You apply a “pepper paste”, wrap the meat in plastic wrap and allow the steaks to temper for an hour prior to cooking. The final result was a super tender, juicy steak cooked to medium perfection with a true pepper “crust”. We served the steaks over Blue Cheese Butter with Roasted Beets ‘n’ Sweets. 1. Heat peppercorns and 5 tablespoons oil in small saucepan over low heat until faint bubbles appear. Continue to cook at bare simmer, swirling pan occasionally, until pepper is fragrant, 7 to 10 minutes. Remove from heat and set aside to cool. When mixture is room temperature, add salt and stir to combine. 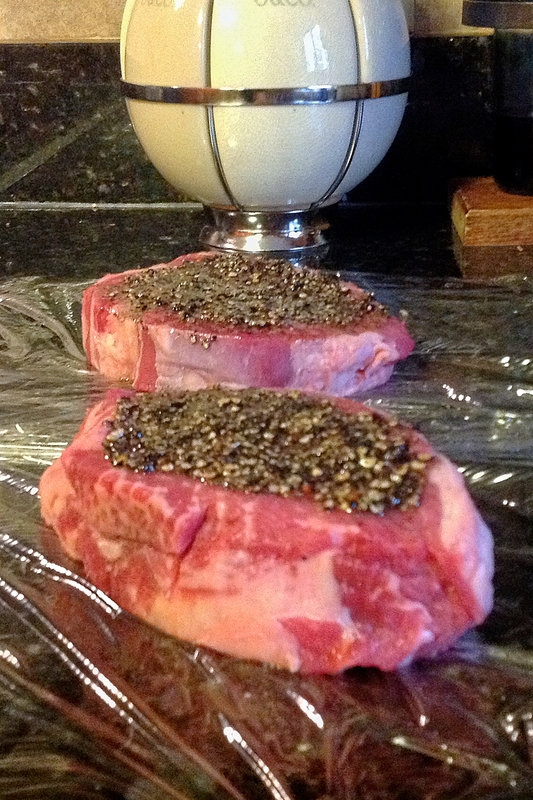 Rub steaks with oil and pepper mixture, thoroughly coating top and bottom of each steak with peppercorns. Cover steaks with plastic wrap and press gently to make sure peppercorns adhere; let stand at room temperature for 1 hour. 2. Meanwhile, adjust oven rack to middle position, place rimmed baking sheet on oven rack, and heat oven to 450 degrees. Heat remaining 2 teaspoons oil in 12-inch heavy-bottomed skillet over medium-high heat until faint smoke appears. Place steaks in skillet and cook, without moving steaks, until dark brown crust has formed, 3 to 4 minutes. Using tongs, turn steaks and cook until well browned on second side, about 3 minutes. Remove pan from heat and transfer steaks to hot baking sheet. Roast 3 to 5 minutes for rare, 5 to 7 minutes for medium-rare to medium. Transfer steaks to wire cooling rack and let rest, loosely tented with foil, for 5 minutes before serving.